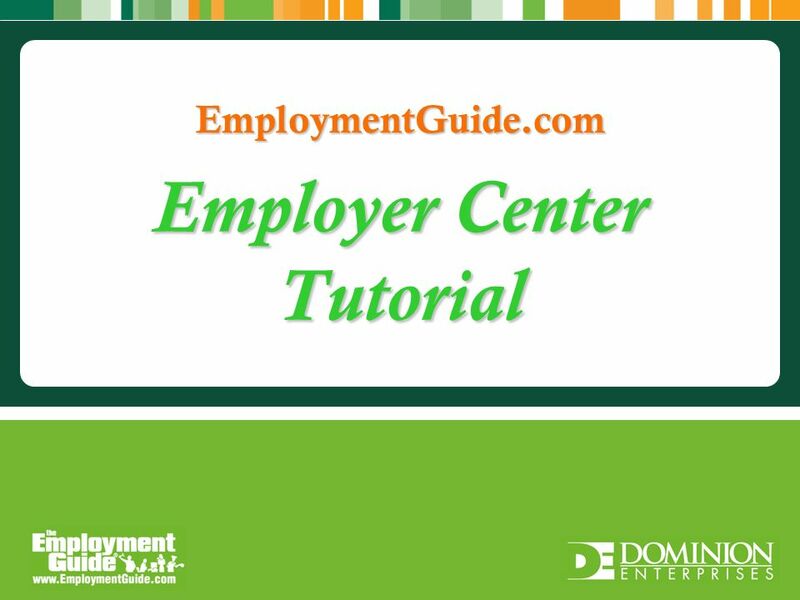 Employer Center Tutorial. 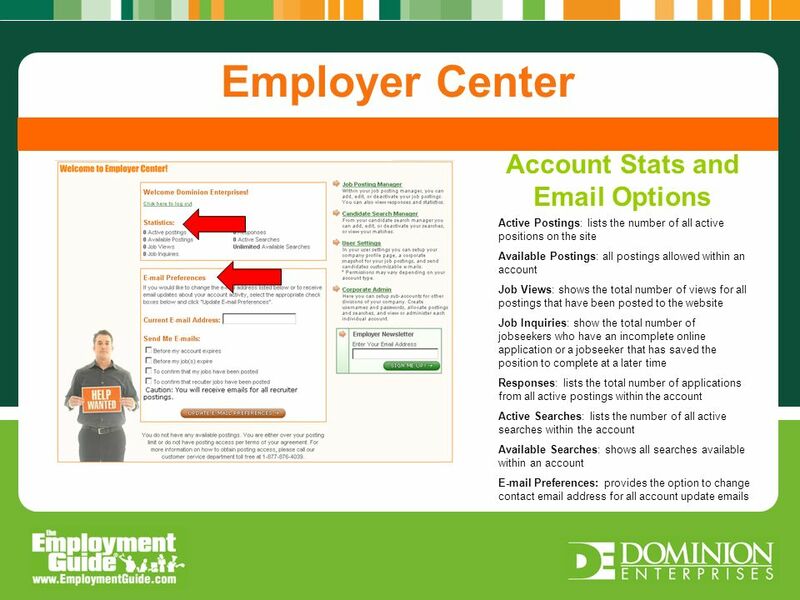 Overview Employer Tools in Employer Center: Job Posting Manager: Within your job posting manager, you can add, edit, or deactivate. 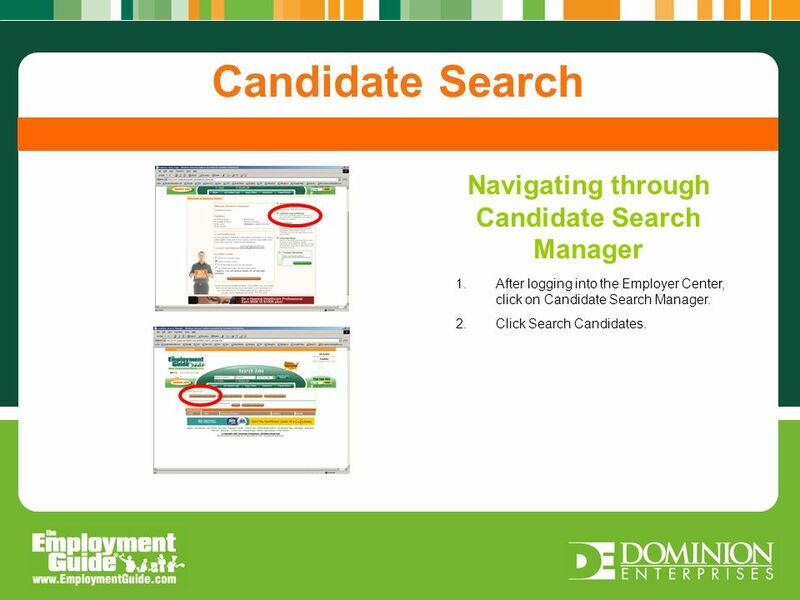 7 Navigating through Candidate Search Manager Post A Job Candidate Search Navigating through Candidate Search Manager 1.After logging into the Employer Center, click on Candidate Search Manager. 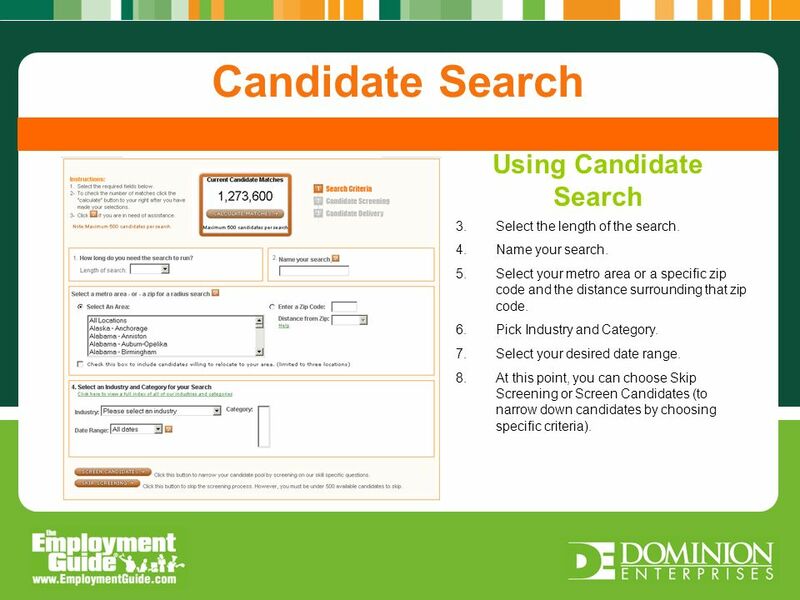 2.Click Search Candidates. 8 Using Candidate Search Candidate SearchPost A Job Candidate Search Using Candidate Search 3. Select the length of the search. 4.Name your search. 5.Select your metro area or a specific zip code and the distance surrounding that zip code. 6.Pick Industry and Category. 7.Select your desired date range. 8.At this point, you can choose Skip Screening or Screen Candidates (to narrow down candidates by choosing specific criteria). 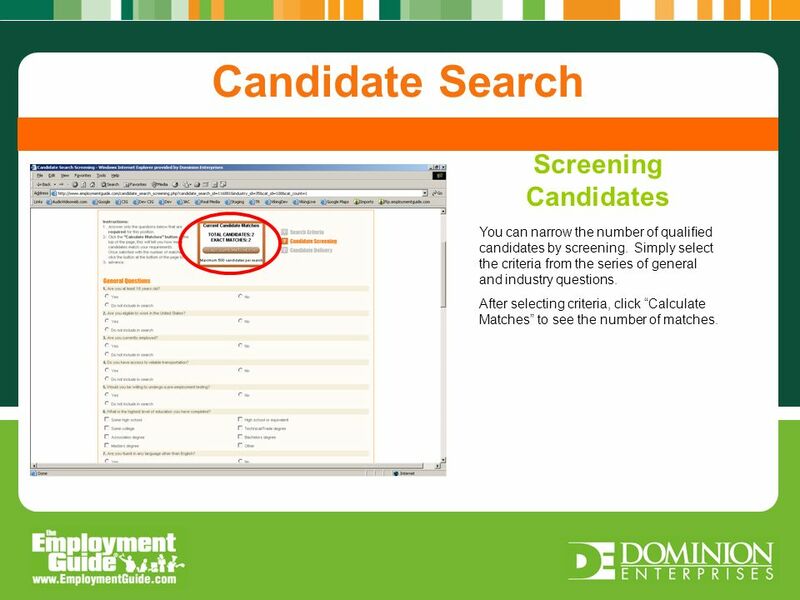 9 Screening Candidate Candidate Search Post A Job Candidate Search Screening Candidates You can narrow the number of qualified candidates by screening. Simply select the criteria from the series of general and industry questions. After selecting criteria, click Calculate Matches to see the number of matches. 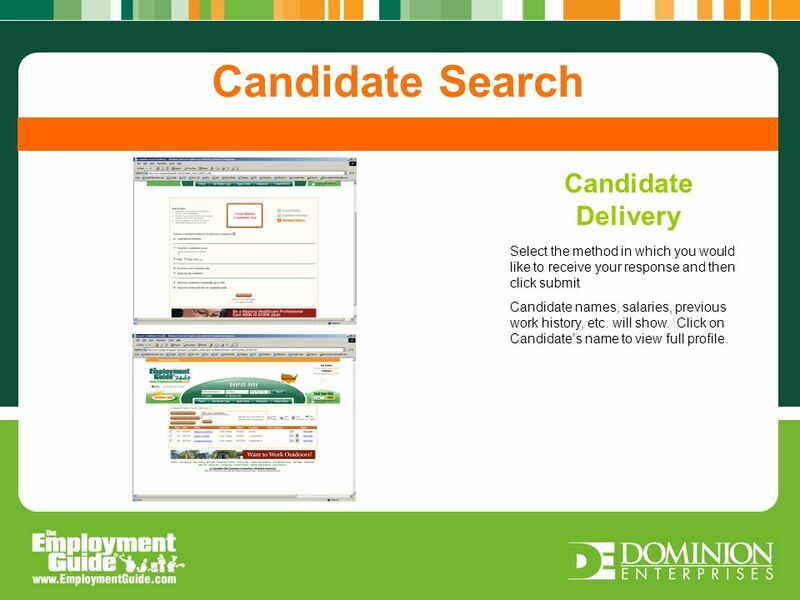 10 Candidate Delivery Screening Candidate Candidate Search Post A Job Candidate Search Candidate Delivery Select the method in which you would like to receive your response and then click submit Candidate names, salaries, previous work history, etc. will show. Click on Candidates name to view full profile. 11 User Settings Candidate Delivery Screening Candidate Candidate Search Post A Job User Settings Tools Manage Profile: Create or edit your company profile page that jobseekers can link to from every one of your postings. 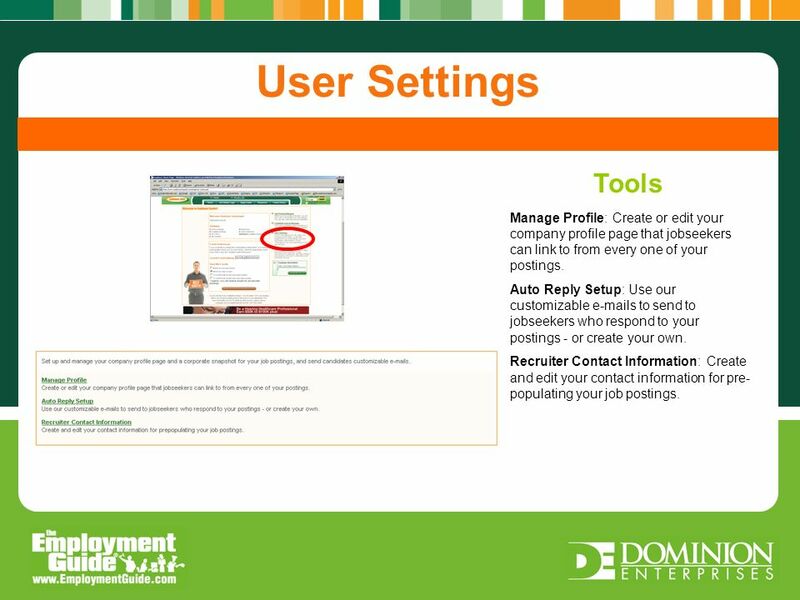 Auto Reply Setup: Use our customizable e-mails to send to jobseekers who respond to your postings - or create your own. Recruiter Contact Information: Create and edit your contact information for pre- populating your job postings. 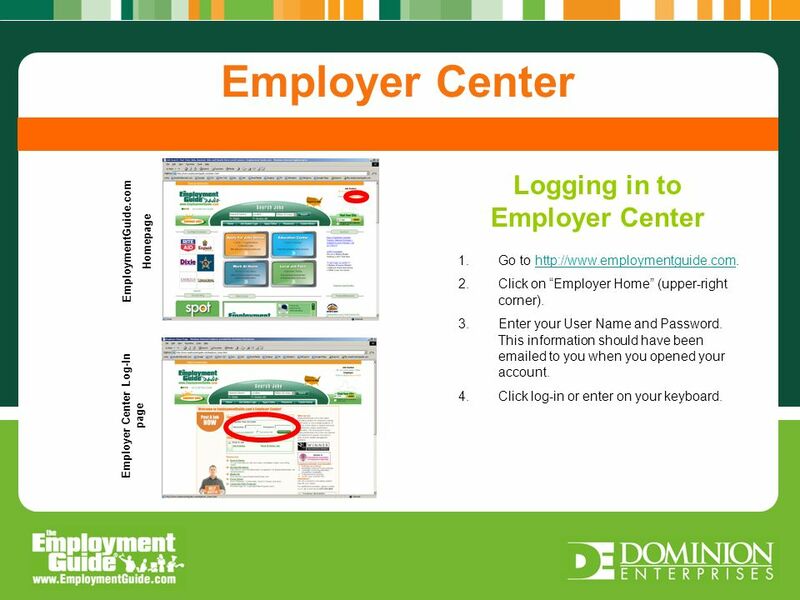 Download ppt "Employer Center Tutorial. 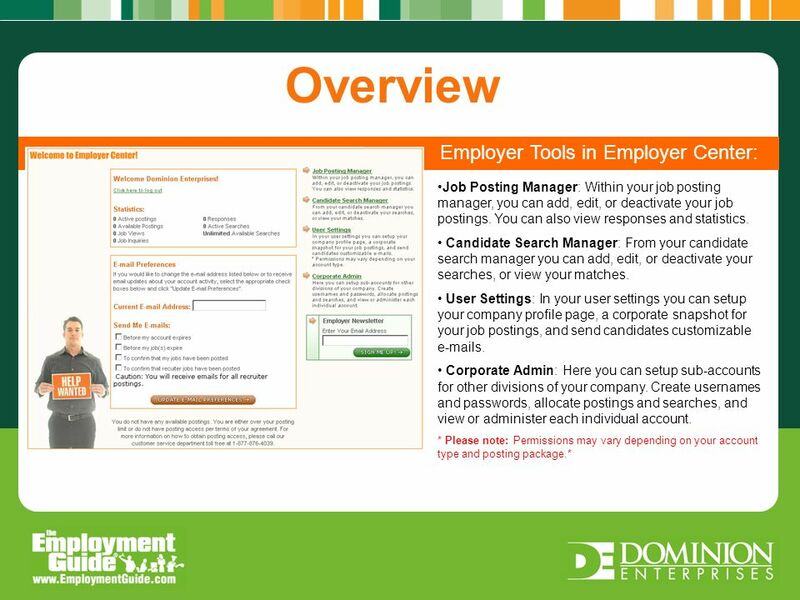 Overview Employer Tools in Employer Center: Job Posting Manager: Within your job posting manager, you can add, edit, or deactivate." Support.ebsco.com Grouping Databases by Subject in EBSCOadmin Tutorial. Support.ebsco.com EBSCOadmin Reports & Statistics Tutorial. Using NIMAC 2.0: The Accessible Media Producer Portal NIMAC 2.0 for AMPs. 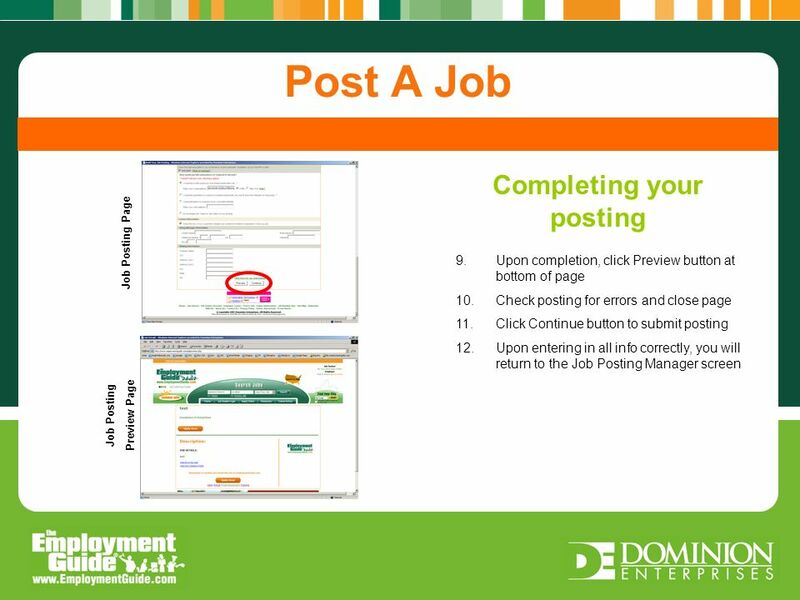 Welcome to the Online Employment Applicant Tutorial Click here for next screen. Introduction to Online Ordering. Log in to OK Choice The web address for OK Choice is Enter your User. Extended DISC Online System User Instruction: How to Run a Team Analysis. Managing Your Organisation’s Portal Team Account Tutorial 7. Login to eShip Global eShip Global is an online shipping service providing access to contracted shipping carriers for outbound letters and packages. For. How to sign up for unite! To begin your registration, go to Employers and Volunteers, and click “Join Now” If you wish. 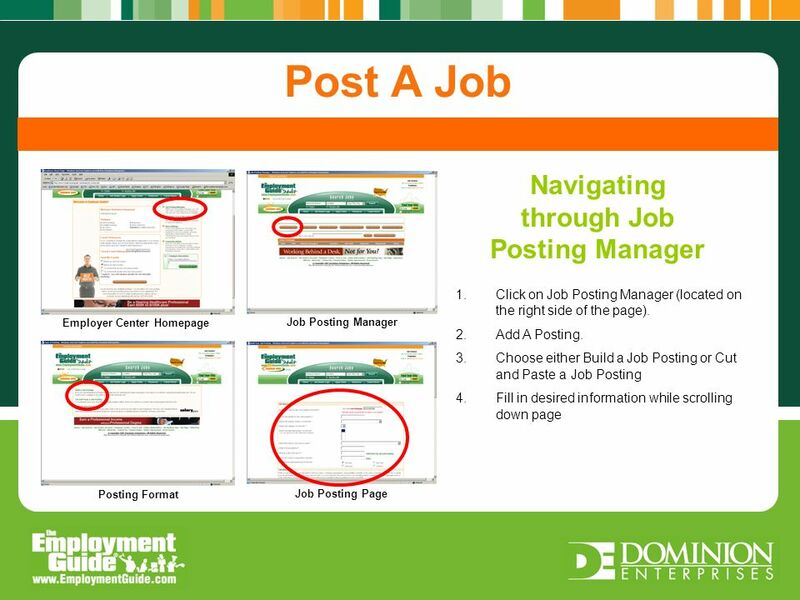 Learn How to Register as a New Employer and Post a Job. 101 Complete Moodle Tutorial. Logging In Navigate to Your login name will. Avon Foundation for Women Breast Health Outreach Program Online Application Tutorial.